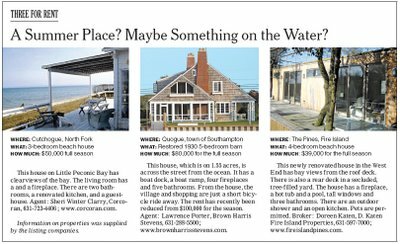 It’s that time of year… the time of year when there are always articles in the paper about whatever summer rentals may still be available in the Hamptons and Fire Island. For some New Yorkers, these getaways are a way of life--a very expensive way of life. Many industries have summer hours, where your work day is a little longer during the week so you can have a half-day on Fridays. That is when the mass exodus occurs, with people fleeing to beaches. Depending on where you go, it’s probably a 2 to 4 hour trip each way, by car, or some combination of train and ferry. (Unless you are really super-rich and can just take a helicopter.) I often tell myself that the travel time would drive me crazy, and that I like spending weekends in the city because restaurants are less crowded, etc., but the truth is that I would love to have a place at the beach to go to on weekends. I’ve had friends who have invited me to places they were renting, which is all very nice but it’s never as relaxed when you’re someone’s guest. If I hit the lottery tomorrow, a house by the beach would be one of the first things I would splurge on. The first two didn't catch my eye so much, though the house in the middle looks cute... but when I saw the third one, I thought it looked rather fun. A fabulous modern house in the Pines-- I would be the envy of all my gay male friends! But of course I have not yet hit the lottery, so I don't have $39,000 to drop on a summer rental. But this is where you start doing all kinds of math. That house has 4 bedrooms, so if I found 3 other people to share it, I would only pay $9,750 for the season. If the season is Memorial Day to Labor Day, that is 15 weeks. So that is only $650 per week. What if I found 4 or 5 more friends to split this house with, each of us going at different times? Would I be willing to pay $2,000-2500 or so for a few weeks of summer getaways? If I took 2 weeks of vacation time during the summer, I might feel like I was getting my money's worth, but just for weekends it wouldn't make sense. Say I did get one-fifth of one-fourth of this house, and used it for 3 weekends and two full weeks. That would be something like $120 a day. It's cheaper than most hotels, but the logistics of renting a house and actually splitting it up that way would be a nightmare. And if I just found a house that was for rent by the week it would probably cost more. That article mentions a $1,500 per week 2-bedroom apartment as being the low end. All things considered, I think my dreamy weekends at my beach house aren't going to happen any time soon. 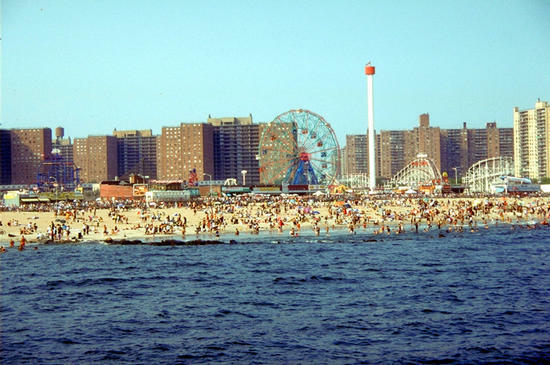 But the good news is that I will soon be moving to a place where my subway ride to Coney Island will be even shorter. And it's much easier to get a hot dog and a beer at Coney Island than it is in the Fire Island Pines. I'd have to go with the first house in the ad. The location being right on the water is idea. I will never have a change to make enough lottery winnings to pay for that rental because ... well, I don't play the lotto!